Windows 10 isn’t without flaws, and one of the more annoying issues is the unresponsive taskbar. With unresponsive taskbar you aren’t able to access your notifications, Start menu or Cortana, so you can see why this is such a problem. Fortunately, we have several solutions available for you. Windows 10 Start Menu and Taskbar not working – Sometimes both your Start Menu and Taskbar won’t work. This might be caused by your antivirus, so be sure to install the latest updates and check if that helps. 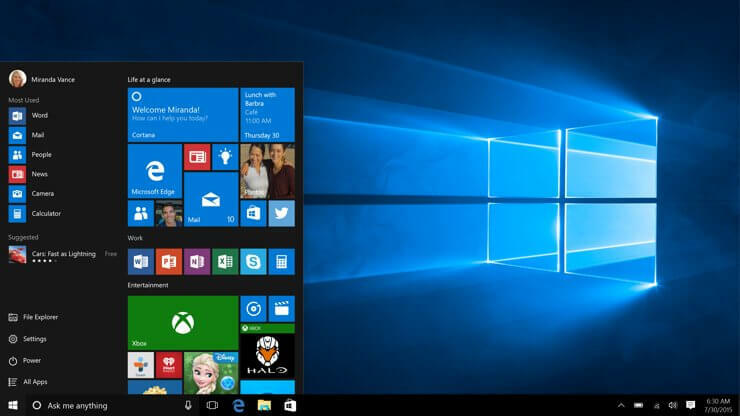 Windows 10 Start Menu not working – This is a similar problem that can occur alongside unresponsive Taskbar. If your Start Menu is not working, be sure to check one of our related articles for a detailed explanation on how to fix this problem. Windows 10 Taskbar frozen, not working – This is a relatively common problem with your Taskbar. To fix this problem, be sure to download and install the latest updates and check if that helps. Windows 10 Taskbar unresponsive after sleep, update – This problem can appear after a recent update. If you suspect that an update is a problem, remove it or perform a System Restore. Taskbar unresponsive at startup – In some cases, Taskbar won’t work as soon as you turn on your PC. To fix this issue, you might have to create a new user account and check if that solves the problem. Press Windows Key + X to open Win + X menu. Now choose Device Manager from the list. 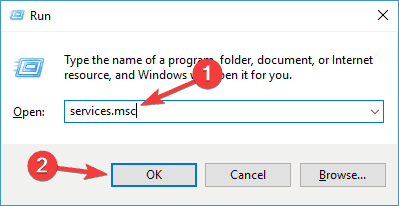 If this method doesn’t work, you can use any other method to start Device Manager. When Device Manager opens, locate your graphics card driver, right-click it and choose Uninstall Device from the menu. After doing that, go to your graphics card’s manufacturer’s website and download the driver that is a couple of months old. Once the download and install the older driver, check if the issue is still there. Sometimes you might experience issues with unresponsive Taskbar due to your antivirus software. Using an antivirus is important, but third-party antivirus tools can sometimes interfere with your system and cause this and many other errors to occur. To fix the problem, you need to disable certain antivirus features and check if that helps. If that doesn’t solve the problem with unresponsive Taskbar, your next step would be to completely disable your antivirus. In case that doesn’t help, your only solution is to remove your antivirus software. Several users reported that Norton antivirus caused this issue on their PC, but after removing it, the problem was resolved. Keep in mind that other antivirus tools can also cause this problem, so you might have to remove them as well. If removing the antivirus solves the problem, your next step would be to switch to a different antivirus. 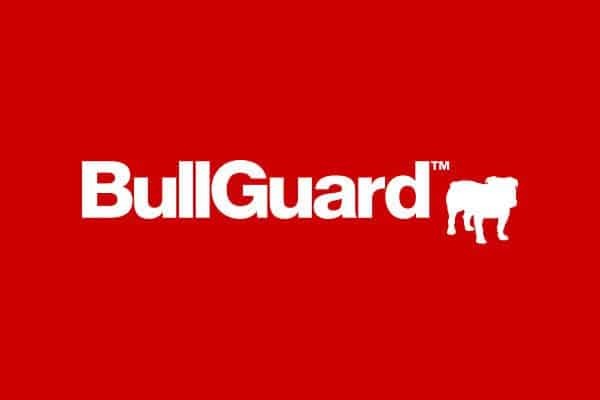 There are many great antivirus tools on the market, but if you want a tool that offers maximum protection without any interference with your system, we suggest that you try out BullGuard. Users report that disabling iGPU MultiMonitor option in BIOS helped fix this issue. To access BIOS you’ll have to press Del or F2 (or some other key depending on your motherboard) while booting. We have to mention that not every BIOS has the iGPU MultiMonitor option. Also, the location of iGPU MultiMonitor option might be different for different versions of BIOS, so there’s no unique way to disable it. You’ll have to try and find it in your BIOS on your own. Press Windows Key + R and type Services.msc. Press Enter to open Services window. 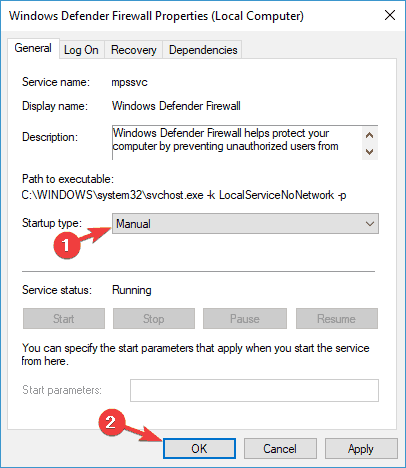 Now find Windows Firewall from the list of services and double-click it to open its properties. Find Startup Type option and set it to Manual. Click Apply. Now in the Services Window in the top left to find a Start this service button to start Windows Firewall. 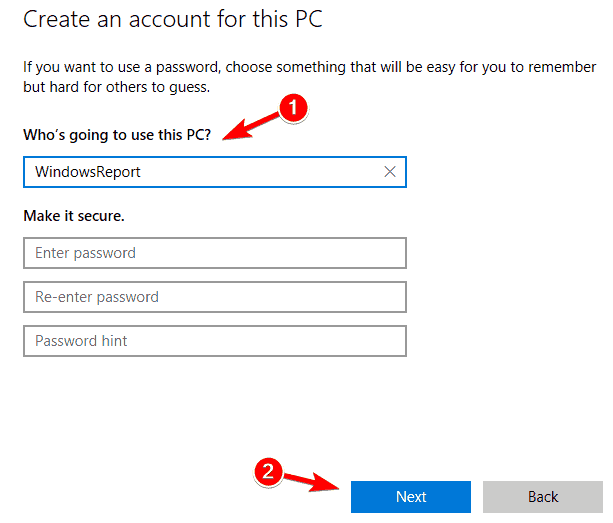 After you’ve enabled Windows Firewall you can proceed to the next steps. 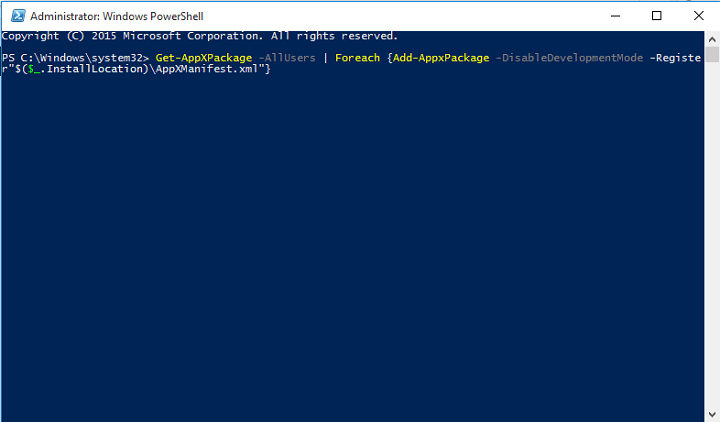 Right-click powershell.exe and choose Run as Administrator. Check to see if the problem is resolved. 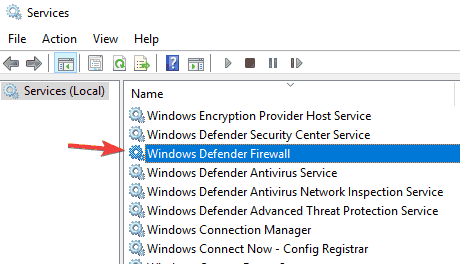 After you’ve enabled Windows Firewall you can proceed to next steps. In the right pane click Check for updates button. If any updates are available, Windows will download them automatically in the background. Once the updates are downloaded, they will be automatically installed as soon as you restart your PC. After your system is up to date, check if the problem is still there. From the menu on the left choose Family & other people. In the right pane choose Add someone else to this PC. Once you create a new user account, switch to the new account and check if the problem is still there. If the issue doesn’t appear on the new account, you might have to move all your personal files to it and start using it instead of your old account. Sometimes third-party issues can cause problems with Taskbar to appear. According to users, applications such as QuickTime or Quickbooks can cause this problem to appear. If you’re having problems with unresponsive Taskbar, the best way to deal with this issue is to remove the problematic applications. There are several ways to do that, but the best method is to use an uninstaller software. By using an uninstaller software such as IOBit Uninstaller, you’ll remove the problematic application, as well as its files and registry entries. This will ensure that the application is completely removed and prevent the problem from appearing in the future. 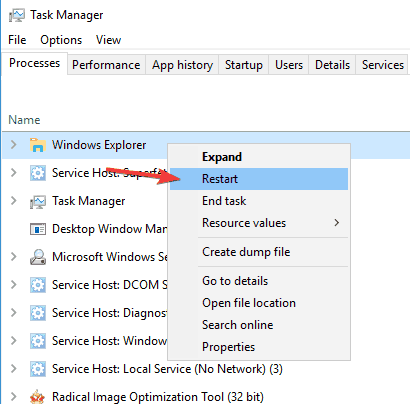 According to users, one way to deal with unresponsive Taskbar is to restart Windows Explorer. Your Taskbar and Start Menu are related to Windows Explorer, and by restarting its process, you’ll also restart your Taskbar. 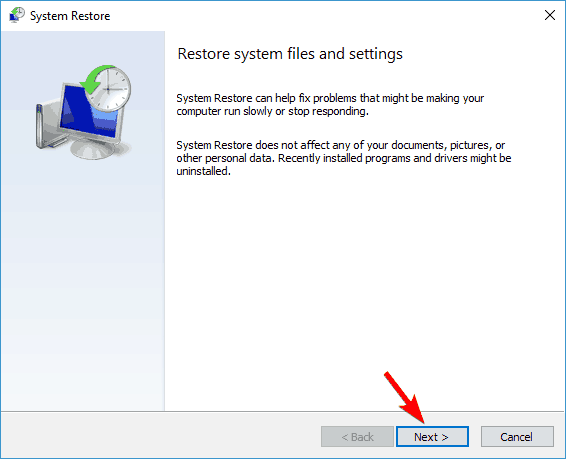 Locate Windows Explorer process, right-click it and choose Restart from the menu. 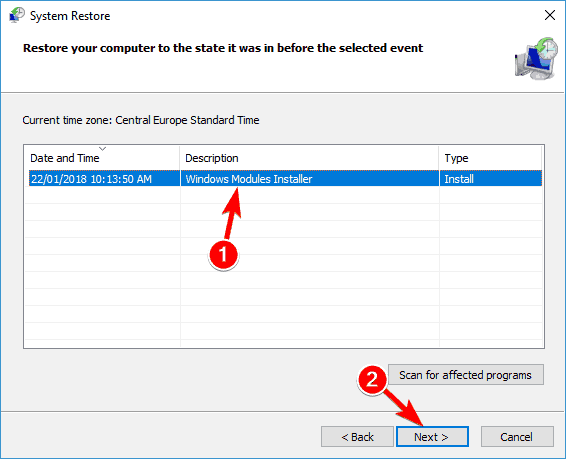 Once Windows Explorer restarts, check if the problem is still there. Keep in mind that this might not be a permanent solution, so if the problem reappears, you’ll need to restart Windows Explorer again. System Properties window will now appear. 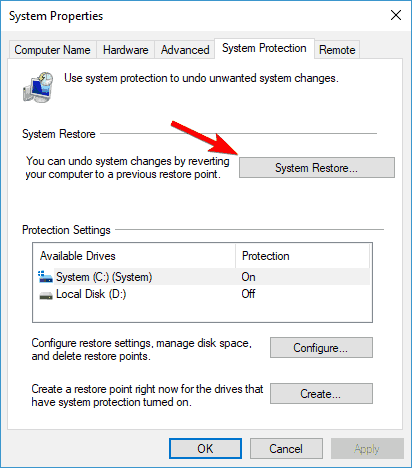 Select System Restore from the menu. 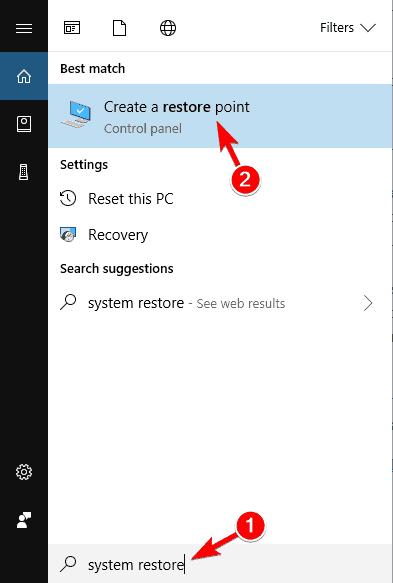 If available, check Show more restore points checkbox. Select the desired restore point and click Next. After the restoration process is completed, check if your Taskbar is working again. This issue with unresponsive Taskbar in Windows 10 can be an annoying problem, but we hope that some of these solutions were helpful to you. 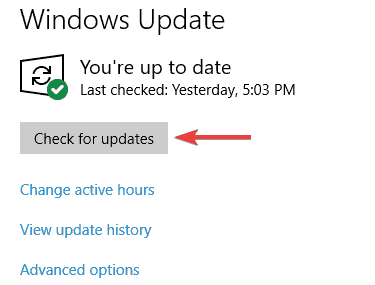 Remember to keep your Windows 10 up to date with latest updates because if none of these solutions were helpful, maybe the latest update might fix this issue.